J Stanger, Contractor. Can anyone date the picture or say where it was taken. The tractor's registration number is BS1015. Must be earlier than 1940 surely? Good photo. This shows an Austin tractor, quite rare and never as popular as the Fordson. They were built in this country from 1919 to 1924 but production continued in France until the German invasion in 1940. Back in the 1980s Jim Corsie had a petrol tank and a radiator for an Austin tractor when he had a garage at the Ayre Mills. Story was that it had been used when they tarmaced the Kirkwall Stromness road. This picture looks as if it shows a road building job but they probably did other roads as well. What an interesting photo Jock. 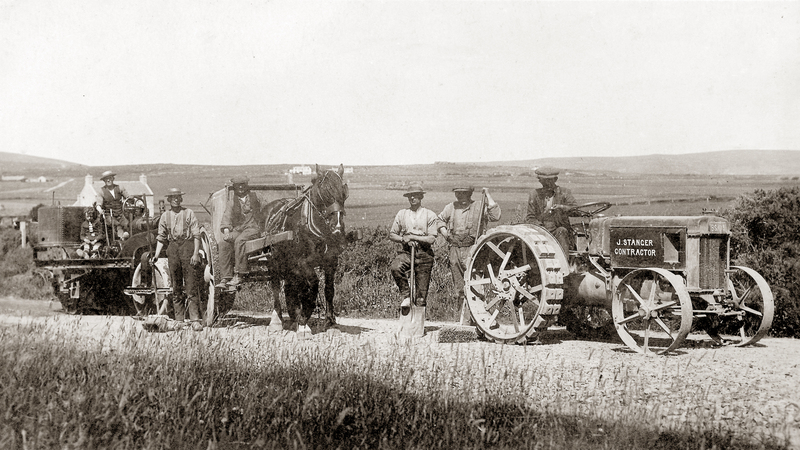 BS 1015 was issued in 1926 to John Stanger Quoys of the Hill Birsay on an Austin tractor with solid rubber pads to the rear wheels. Herbert Austin started to make tractors just after WW1 with a design based loosely on the Fordson. A bit more refined but plagued with reliability problems and was more expensive than Ford. What a pity we can't see the registration on the road roller. I wonder what is in the tank on the horse cart. Tar? Where was the picture taken is the question and who are the men and boy?